On the eastern coast of Laconia, a narrow strip of earth, nearly in the sea, joins with the mainland. It is the extension of an island with a circumference of two miles. At its center is a rock 300 meters high ending in a large plateau. 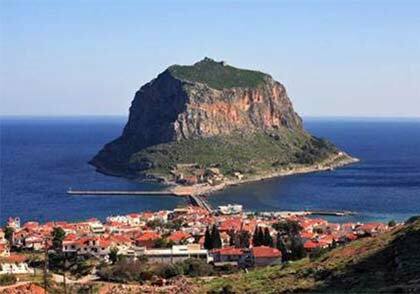 In this rock, Monemvasia, one of the most beautiful castles, was built and, for a thousand years or more, enjoyed prosperity and glory. The upper city was built on the plateau of the rock. Today, only ruins are found. Lower, on the southeast side, facing Myrtoo Sea, the lower city was built, which is populated today while maintaining its medieval character. It is declared a traditional settlement. Steps, carved into the rock, lead down from the upper town. Both cities are protected by walls. The residents of the city are few but there are many visitors throughout the year. Its reputation is worldwide. The island is connected with a low bridge to the opposite shore, where there is a modern small town called Gefyra (Bridge) or New Monemvasia. 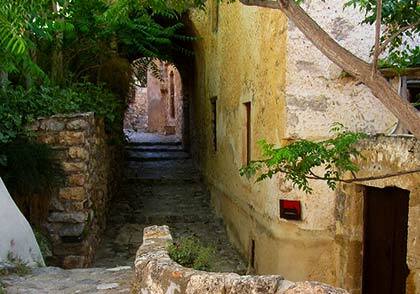 It is the passageway to Monemvasia. 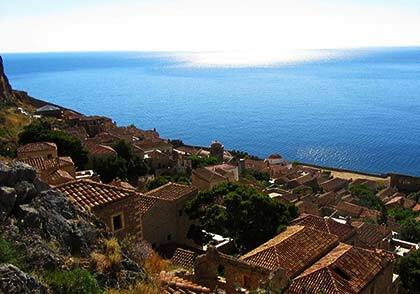 Monemvasia is located 95 km from Sparta, the capital of Laconia. From Sparta take the highway south, turn southeast to Molai and continue to Monemvasia. It can also be reached by boat. Yachts can moor in the harbor. It is one of the safest anchorages. Gefyra is the center of a developed tourist area with hotels and other accommodation for a pleasant stay. In the square by the sea, there are restaurants and taverns, as well as many tourist services. There are many shops and stores to cover all needs. The area has many beautiful beaches. Gefyra, an organized beach, is located at Mandraki port. To the north, Kakavos beach and six kilometers from the town, Pori beach. 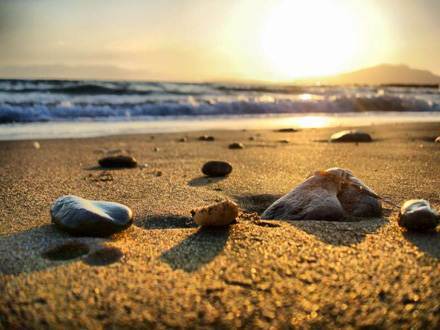 To the south, the beaches are near the villages of Agia Paraskevi, Agios Stefanos and Nomia. The long beach, Xifias is seven kilometers away. Foutia village, built at a height of 340 meters, offers magnificent views, and on the south coast, in the village of Agios Fokas, there are beautiful bays. 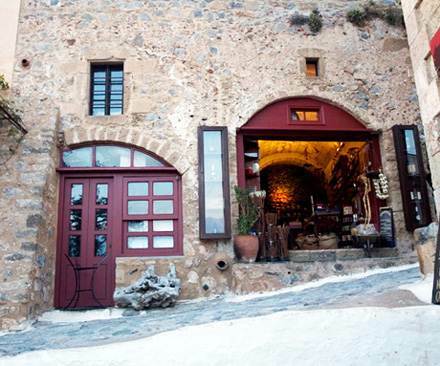 All tourist services are also offered inside Monemvasia castle, without compromising its medieval character. The main street is lined with many shops and fine restaurants can be found inside traditional houses. Luxury hotels can be found, but accommodation is also available in traditional houses and mansions. The low bridge, connecting the mainland coast with the rock of Monemvasia, is 130 meters long. This narrow strip gave its name to Monemvasia. 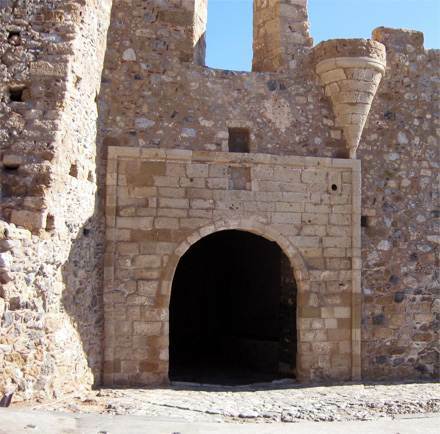 It was the only emvasis, meaning the only entrance to the island, as mentioned in an old text that recounts the building of Monemvasia. The first settlers came here in the late 6th century AD looking for a place that would protect them from the pirates of the time. The road leads to the southeastern side of the cliff at a height of 40 meters and ends at an open space which, today, is a car park in front of the main gate of the castle. From here, the climb is on foot. Approaching the main gate, the atmosphere begins to change. The iron gates are riddled with bullet marks from the many besiegers of the city over the past centuries. The ramparts of the double wall almost touch the sea. The castle is in good condition, especially in the lower city. It was built by the Byzantines, followed by the Venetians and the Turks who made repairs and additions. The castle tells the story of the history of Monemvasia. There is little information on the beginnings of Monemvasia from its origin in the late 6th century to mid 12th century. Then, in 1147, it was attacked by a fleet of Normans. Inhabitants fought bravely and drove back the invaders. A century later, in 1246 the castle was besieged by the Franks under Godefreido Villardouino. The town surrendered after three years due to starvation. In 1259 Villardouino was captured by Michael Paleologos the 8th. In order to win back his freedom, he gave the three great castles of Laconia, Monemvasia, Mystras and Mani to the Byzantines. Monemvasia became a naval and military base and headquarters of the commander of the Byzantine emperor's possessions in the Peloponnese. The geographical position made it an important landmark for travel and the town began to develop economically and culturally. But its prosperity made it the main target of pirates. In 1292 a terrible attack by the Catalans was repelled. During that period, pirates attacked mainly Venetian and Genoese ships carrying goods. 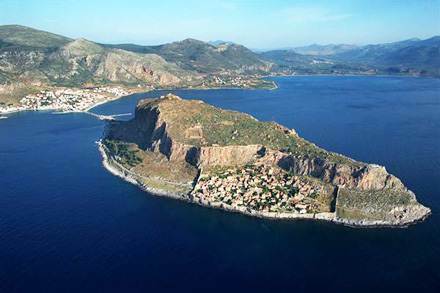 In 1419 Monemvasia surrendered, for the first time, but briefly, to the Venetians. 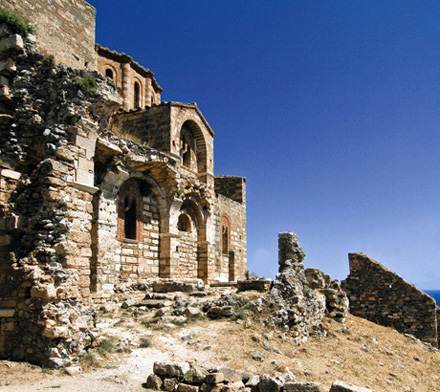 It was returned to the Byzantines and, in 1460, the Turks completed the conquest of the Peloponnese seizing the fortress of Mystras. Thomas Paleologos, who was in Italy, became lord of the land. He placed it under the protection of the Pope, who gave it to the Venetians in 1462. The Venetians called Monemvasia the Naples of Malvazia referring to the name of the famous wine Malvazia, which was transported from here to the West. From that time, the city was often engaged in long wars between Venice and Turkey. In 1502 the Venetians possesed only Monemvasia and Nafplion. In 1537 a new war broke out and in 1540 the Venetians capitulated by surrenduring, among others, the two cities to the Turks, who named Monemvasia Castle, violet castle. The Venetians returned in 1690, bombarded the city from the sea and conquered it after a siege. In 1715, they sold the city back to the Turks. After the failed revolt of the Greeks in 1770, known as Orlofika, during the war from 1768 to 1774 between Russia and Turkey, Monemvasia began to decline. Three days after the beginning of the Greek Revolution on March 25, 1821, the Greeks besieged the castle and liberated the city on July 23. It was the first of the great castles of the Peloponnese invaded by the rebels. When passing through the central gate of Monemvasia, it feels like time stands still. Modern life is integrated with the town’s medieval character. After the entrance, more like a square, the main street begins to climb, a shopping path, as they call it. Colourful and charming. Visitors hesitate at almost every step to see the old buildings or do some shopping. During the festive days of summer, it is so crowded, it takes time to reach the end of the road. The walk continues along the narrow cobbled streets, leading to low arches and steps ,as well as houses seemingly glued together with balconies facing the sea. You can easily distinguish the mansions and the Venetian influence. Particularly the churches reflecting the Byzantine and Venetian periods. The walk leads to the ramparts of the castle where, in the outskirts of the lower town, homes of a newer era exist. The great Greek poet Yannis Ritsos was born here. 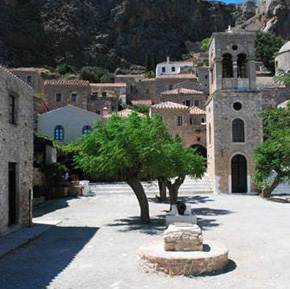 In Monemvasia there are about forty churches. Most important is the church of Christos Elkomenos, a triple basilica with a vaulted dome. It is the cathedral of Monemvasia. According to tradition, the church founded in the 12th century by the Emperor Andronikos Paleologos, the Second and was rebuilt in its present form in 1691 by the Venetians. 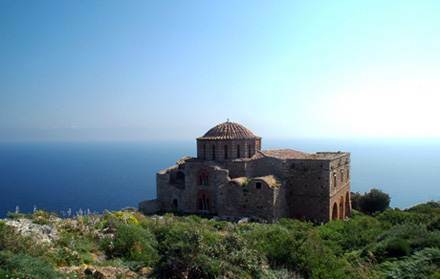 It is the largest church in Monemvasia. Inside, there was the famous painting of Christ Elkomenos, which was usurped by Isaakios Aggelos and taken to Istanbul. It was replaced with a painting from 1700, from the Ionian Islands. There is also a very important icon of the Crucifixion of Christ from the 14th century and two marble imperial thrones. Across the street there is a large building with a dome. According to spoken tradition, it was a church dedicated to St. Peter Bishop of Monemvasia. During the Ottoman occupation, it was converted to a mosque. Today it houses the museum. Other important churches reflecting Byzantine and Venetian characteristics, are St. Nicholas built in 1703, the Virgin Myrtidiotissa or Kritikia and the Virgin Chrysaphitissa. There is much folklore concerning how the icon of the Mary Virgin came from Chrysapha, a village near Sparta. Also, of particular interest are the churches of Aghia Anna, Aghios Dimitrios, Aghios Stephanos and Aghios Andreas. The ruins of the upper city are on the plateau at the top of the cliff. 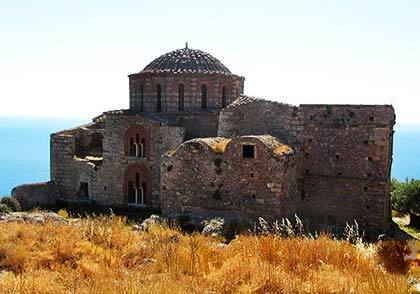 The only monument that is intact is the church of Aghia Sophia, the most important monument from the Byzantine era. The church is an octagonal church with dome, the same as the famous church of Dafni in Athens. Built in the late 12th and early 13th century by the Emperor Andronikos, the church followed the fate of the city. During the Venetian occupation, it was a catholic church and under Turkish rule was converted to a mosque. The frescoes were covered in lime. Despite the modifications and passage of time, the church retains its beautiful proportions and the elegance of its architecture, as well as the magnificence of its interior. Since its early beginnings, a few but exceptional paintings have survived. On the southern side of the building, there is a double porch that resembles the churches of Mystra. On the plateau, there is also the fortification gate. There are the walls of the city, the remains of the house of the Venetian Governor, lodges, outposts and large tanks to collect water, as well as other ruins. The view, especially from the side of Aghia Sophia, is amazing. The surrounding sea lies below the walls and houses of the lower city, which continues to exist and attracts thousands of visitors. 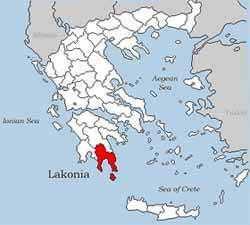 Laconia is located in the southern Peloponnese, south of Arkadia, east of Messinia and on the south and southeast coast of the Peloponnese. The area has a long history dating from the Neolithic Period and offers countless natural wonders, from its mountains to glorious beaches. Sparta and Gytheion, the Mani and the medieval cities of Mystras, Monemvasia and Geraki are located in Laconia. The landscape is rich in history with archaeological and historic sites, castles and traditional villages. On the western and the eastern sides, two of the most beautiful Greek mountains rise from north. On the west, Taygetos, with the highest peak in the Peloponnese, Prophet Helias, 2407 meters. On the east Parnonas, the highest peak, Great Tourla,1935 meters. The Laconic Gulf has an opening at its entrance 34 nautical miles and the distance from the river it is 23 nautical miles. To the west is the Mani peninsula and to the east, the Epidaurus Limira peninsula. The Mani peninsula, an austere, rocky land is a continuation of Taygetos. In the area of Gythio, Kato Taygetos or Sangias rises, with its highest peak at 1,218 meters, ending at Cape Tenaro. The natural environment of the eastern peninsula offers a different landscape. The Epidaurus Limira peninsula, with low, rolling hills, is the continuation of the Parnon mountain, green hillsides that slope to Cape Maleas. Elafonisos is located on this side of the Laconian Gulf. It is a small island with pleasant beaches that once joined the mainland. On the coasts of both peninsulas, there are bays and small beaches, as well as villages and harbors. On the long, sandy beaches of Gytheion, the Caretta Caretta sea turtles lay their eggs in summer.